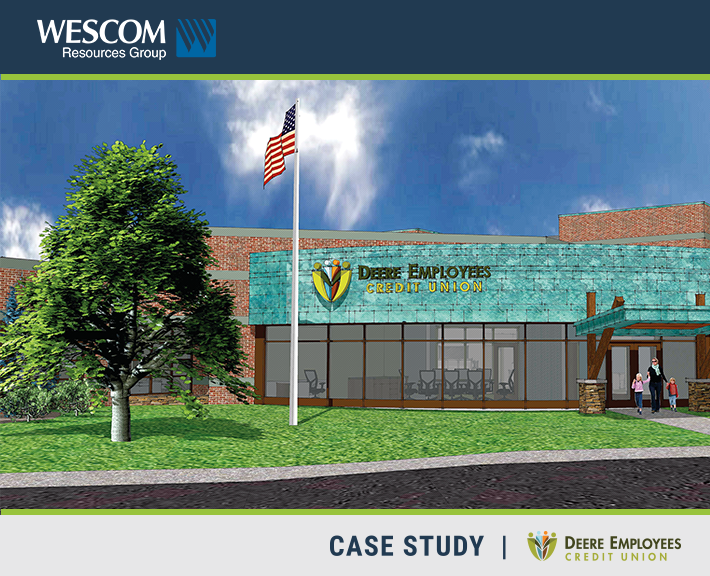 Based in Moline, IL, Deere Employees Credit Union (DECU) boasts nearly 36,000 members and $1 billion in assets. Founded in 1935, DECU serves the employees, retirees and family of John Deere & Company both online and through branches located at John Deere facilities around the country. DECU uses Wescom Resources Group’s (WRG) UNITRI Service Bureau and Symmetry eBanking suite of mobile and online banking solutions. Supporting Growth with Limited IT Staff: DECU recognized it couldn’t consistently and efficiently maintain the highest levels of information technology talent and expertise in-house. To continue to grow and scale its operations, the Credit Union needed to outsource some functions to an experienced IT vendor. Maintaining Outstanding Member Service: DECU was unwilling to sacrifice its focus on providing the highest levels of service and value to its members to support a growing IT infrastructure. Preparing for Disaster Recovery: In the event of a significant disaster or business interruption, DECU could not afford to lose its access to member data. It needed immediate availability to a secure and reliable failover option. Offering the Latest Online Technology: DECU’s sophisticated and tech-savvy members expect convenient account access at home, at work, and on the road. The Credit Union recognized it needed to provide its members with the best online and mobile banking solutions to meet these demands. After searching for a technology partner that could help address their set of challenges, Deere Employees Credit Union selected WRG’s hosted UNITRI Service Bureau solution. WRG remotely hosts the DECU data center and supports its connection to the Symitar Episys core system platform. WRG takes care of all DECU’s hardware updates, replication, and disaster recovery preparedness needs. In addition, DECU selected WRG’s Symmetry eBanking suite of online banking and mobile banking solutions, enabling the Credit Union’s members to have convenient, real-time access to their accounts and loans. Seamless Integration: WRG’s UNITRI Service Bureau integrates tightly with leading core solutions including Symitar’s Episys and Corelation’s Keystone, resulting in a virtualized platform that performs as well as an in-house system, with no on-site hardware required. Worry-Free Uptime: WRG’s service bureau solution ensures the Credit Union will not experience any costly, member-impacting downtime, even if faced with a localized disaster or business interruption. Focus on the Member: By allowing WRG to run the IT operations, DECU can focus on its core strengths and differentiators, like offering industry-leading service and value to its loyal members. Continuous Innovation: Over the many years since starting with WRG, DECU’s member expectations have grown. DECU’s members appreciate the latest functionality and real-time account access that WRG’ Symmetry eServices suite of online and mobile banking services provides. DECU continually adds new WRG innovations when they are rolled out, such as biometric fingerprint login, mobile check deposit, and most recently, credit card controls. Fewer Staff: With the support of WRG, DECU has been able to keep its IT department head count at minimal levels. Top Ratings Among Peers: Lewin is proud of DECU’s unrelenting focus on its members. In fact, the Credit Union consistently sits near the top of Callahan & Associates’ “Return of the Member” (ROM) ranking, a measurement of member value that considers factors such as loan and deposit rates, the diversity of services offered, and members’ product usage. DECU has ranked first in its asset peer group, and among the top credit unions in the country for ROM for several years. Lewin credits WRG for helping DECU maintain its focus on its members. Backed by Wescom Credit Union, one of the nation’s largest credit unions, with nearly $3.9 billion in assets and serving more than 200,000 members, Wescom Resources Group provides credit unions with advanced technology solutions that increase their competitive edge. With over 130 clients, WRG is a leader in innovative technologies for the credit union industry. Through its Symmetry eBanking suite, WRG offers an integrated digital channel solution that includes Online and Mobile Banking, Bill Pay, eAlerts, Multi-Factor Authentication, Member-Directed ACH, online account opening and more. WRG also offers one of the most robust Service Bureau solutions in the credit union industry. WRG’s Tellergy® solution provides branch automation for today’s modern credit union. For more information, visit wescomresources.com.